Home News Myoko NO1 ! This year Myoko stepped up its game even more and totally blew away every other resort in Japan. When it comes to snow Myoko is constantly at the top of all the resorts in Japan. Myoko proves year after year that it is the best place in Japan to visit when it comes to guaranteed volume of snow, which in turn means guaranteed powder for those on the slopes each day. 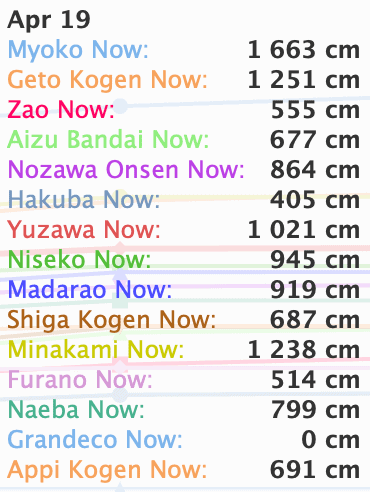 Check out this chart from snowjapan.com that tracks the total cumulative snowfall during the season. Myoko sits top each month and by April has comfortably seen over 16 meters of snow!!! Myoko proves each year that it’s the place be, beating out other popular resorts such as Niseko and Hakuba with ease. Last year Myoko was also top of the charts in January and was a close second at the end of the season. If you are unsure where you want to be next winter in Japan, this data surely proves that Myoko is the best choice by far if you want great snow.